Hawaii Is Diverse, But Far From A Racial Paradise The state is known for its "Aloha Spirit" — a diverse mix of friendly people living on an island paradise. The rainbow of cultures its residents brag about is no exaggeration, but some say that beneath the veneer of geniality are deep-seated ethnic and racial tensions between the island's white community and native Hawaiians. Hawaii has the highest racial minority population of any state in the union — 75 percent, according to U.S. census figures. 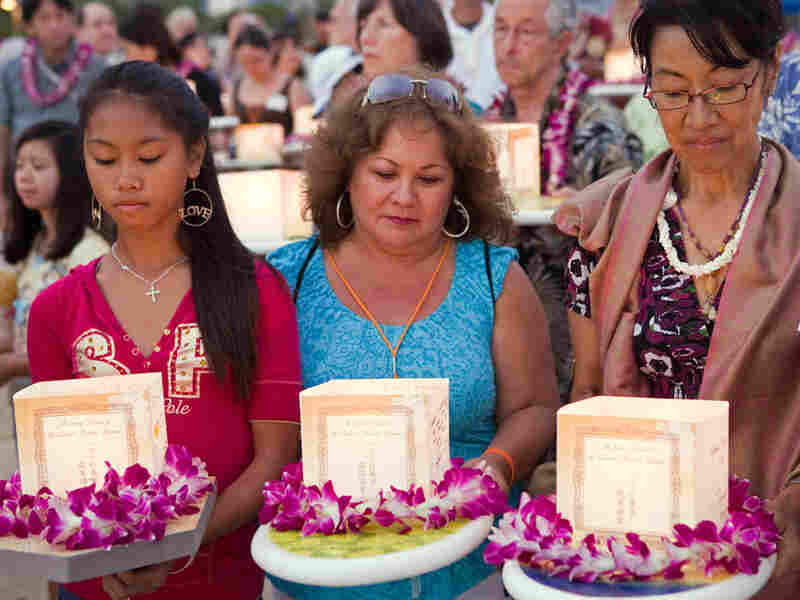 Here, participants prepare to set afloat their candle-lit memorial lanterns during a ceremony earlier this year in Honolulu to honor loved ones who have passed away. Hawaii is known for its "Aloha Spirit" — a diverse mix of friendly people living on an island paradise. The rainbow of cultures its residents brag about is no exaggeration, but some say that beneath the veneer of geniality are deep-seated ethnic and racial tensions between the island's white community and native Hawaiians. Hawaii has the highest racial minority population of any state in the union — 75 percent, according to U.S. census figures. John Osorio, professor of Hawaiian studies at the University of Hawaii at Manoa, tells host Liane Hansen that the state's history is a story of accommodation as waves of foreigners flowed through the islands — and never left. "First Europeans and then Americans and then Asians" arrived, Osorio says, many of them as contract labor during the 19th century. "The way I see it — and an increasing number of Hawaiians see it — in exchange, the United States took Hawaii as a possession in 1900 and has held on to us ever since." Native Hawaiians, he says, have been pushed to the margins. "And it's not a nice place to be," he says. Those margins include high incarceration levels, very little land ownership and poor education. "This is such a different situation than it was in the 19th century, when we were a kingdom. When we had our own government, and when we had one of the highest literacy rates in the entire world." But he thinks it's more of a socio-economic problem than a race issue. He sees what he says are minor racial prejudices, "but in the end, we never created a systematic or rigorous system of expectations of other people based on race. And we certainly never created a system on which we thought one race was superior to another." Yet there's a movement in the state to create a separate region for those who identify as native Hawaiians — similar to American Indian reservations on the mainland. Osorio says he believes in the right to self-determination. "I believe [Hawaiians] had the right to create their own nation in the 19th century, and I believe they have the right today to have that restored." Retired professor Kenneth Conklin, however, says state-sponsored preferences for native Hawaiians are reverse discrimination. "It's not so much that I am against Hawaiian sovereignty," he says, "but rather that I am in favor of unity and equality." Attracted by the racial diversity of the islands, Conklin, who is white, moved to Hawaii from the mainland 17 years ago. At first, he says, he was inclined to go along with the sovereignty activists, but after studying Hawaiian history, turned against the movement. "There was no historical or legal or moral basis for supporting race-based political sovereignty for ethnic Hawaiians," he says. "So then I began getting concerned about it, because I see great injustice here. "I believe everyone should be treated equally by the government," he says, "which means that I oppose racial entitlement programs — of which we have many, many here in Hawaii. "For example," he says, "we might look at black people on the mainland United States and say they're having great difficulties. They were formerly in slavery, and they still are suffering from higher unemployment and lower income and worse health than the rest of the population. How about creating a government for them and giving them the authority to negotiate with federal and state governments to take money, land and jurisdictional authority? Think what a nightmare that would be, particularly for African-Americans." As might be expected, Conklin is criticized by some as racist. It is a matter of race, he says, but he compares it to the racially divided society of South Africa in the second half of the 20th century. "I'm saying, here in Hawaii, let's tear down this wall of apartheid that we've been building for all these years and, for goodness' sake, let's not set up a new one."